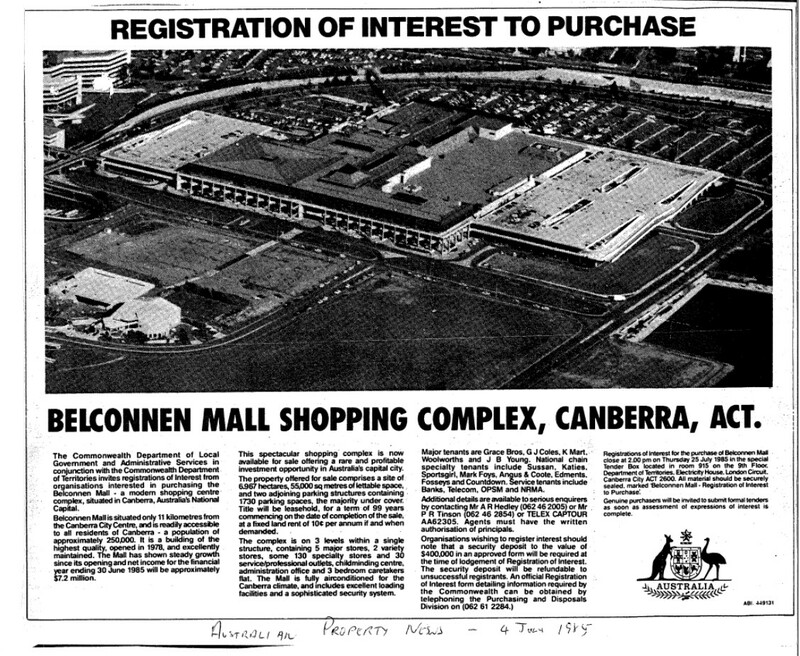 In 1985 Belconnen Mall, the largest ACT land asset, was put out to tender by the Commonwealth Government. Built and managed by the Canberra Commercial Development Authority (CCDA) as a trading enterprise for the ongoing benefit of the Canberra community, the mall was once seen as a successful experiment in social policy. 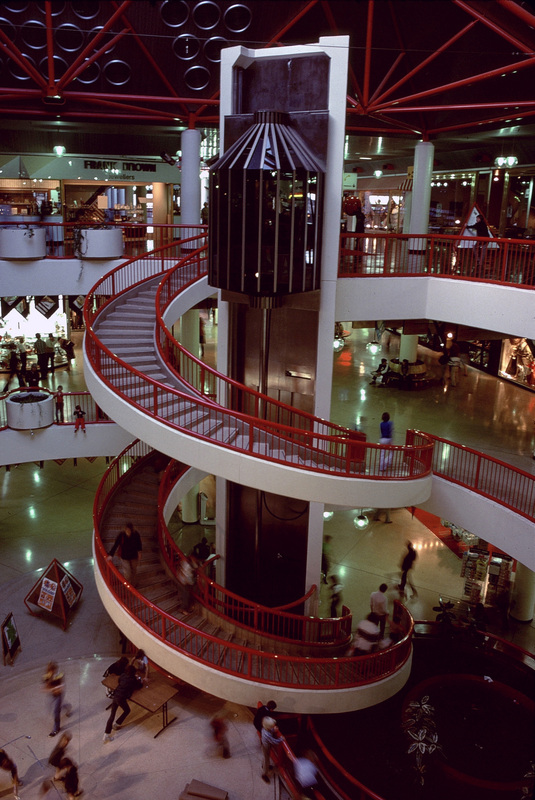 However by 1981 the Belconnen town centre was starting to hum with new office buildings and community facilities underway, and their development directly influenced the services provided in the mall. 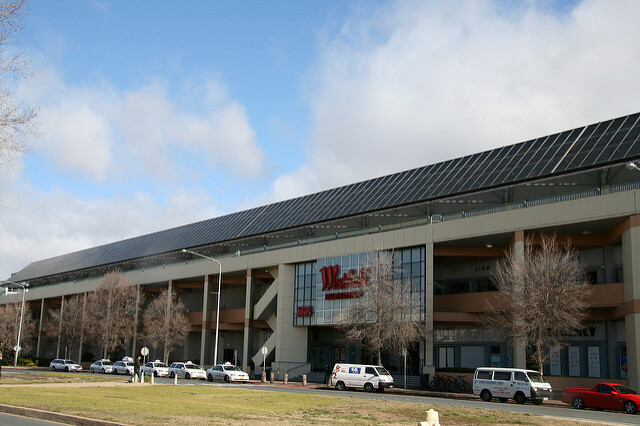 With self-government looking likely, the sale of the mall became a topic for discussion both within the Commonwealth government and the Canberra community. Should the mall continue to be treated as a community resource, or should the government stop trying to provide services in competition with business? 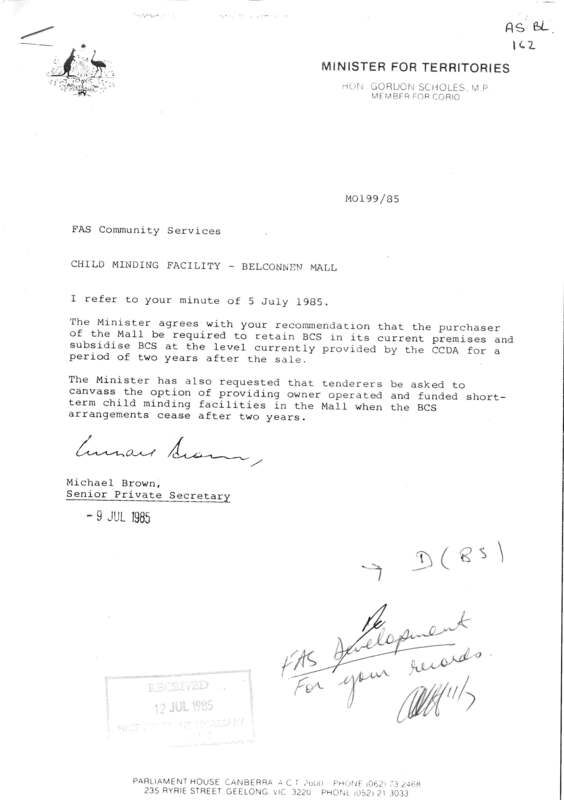 Records surrounding the management and sale of Belconnen Mall are ArchivesACT’s March Find of the Month. Monday 16 October 1978, the Minister for the Capital Territory, Mr Bob Ellicot officially unveiled a plaque to mark the third and final phase of opening Belconnen Mall. 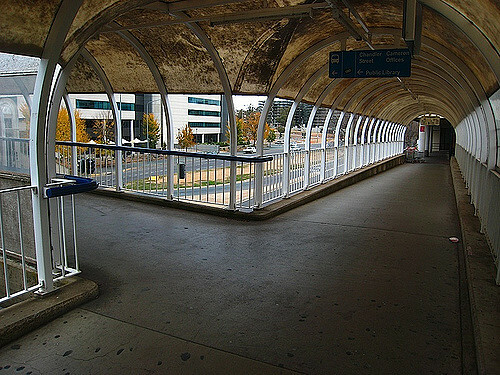 The Belconnen bus interchange was also opened that week and featured a series of walkways, including the famous bridge, which enabled shoppers to travel over the traffic between the mall and the buses. The architects of the mall were given an opportunity to break from ‘traditional’ shopping centre designs and instead were able to consider how the community could also use this space. Community spaces, exhibit areas, casualty rooms and ‘handicapped’ toilets – considered unusual at the time - were all designed around a central public area, where activities could also be undertaken. The inclusion of real trees and plants, and an abundance of natural light was designed to ‘imitate life’. Plans to include recreational facilities were cut from the original plans, however, some community services were included such as the very popular short term day care facility that offered timeslots as short as an hour giving ‘at home mothers’ some respite in their day. 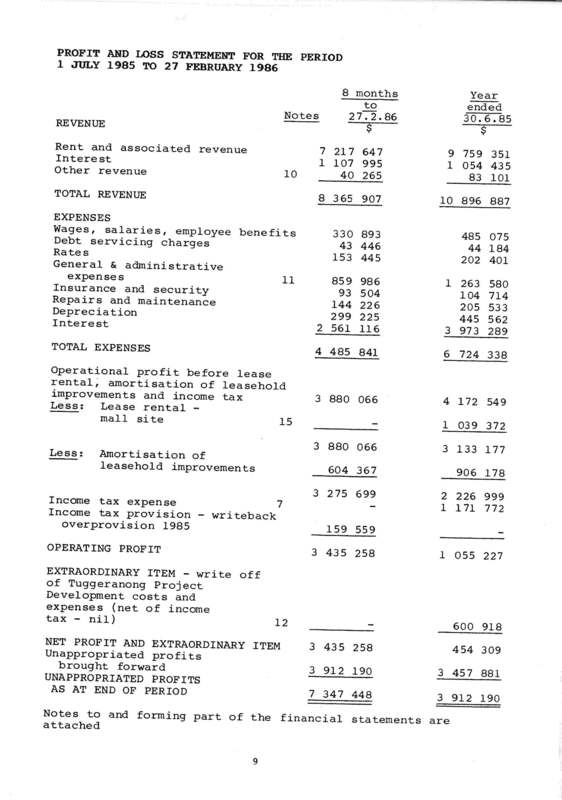 The annual reports of the CCDA show that the mall made a slow start, with a loss in the first financial year of $283,000. 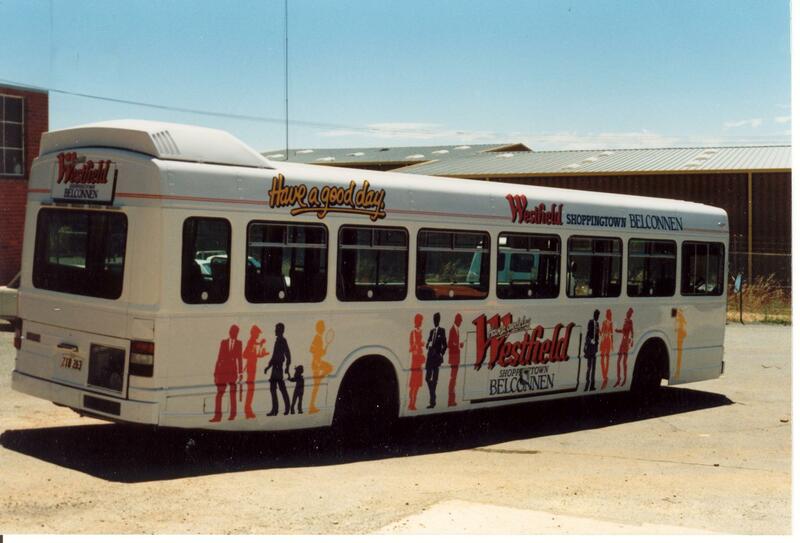 In FY1979/80, this was turned into a small profit of $50,000 before loan repayments, repairs and depreciation. The following year the total profit was reported as passing the one million dollar mark and the $38 million dollar development was valued at around $60 million. The profit for the mall was to continue to rise, with a profit of $5.5 million reported in FY82/83 and a final profit of $7.34 million reported for the last 8 months before the sale ,. By then the mall had an estimated overall value of $85 million. Some of these profits were used to fund services in the Belconnen community, including the fledgling Belconnen Community Services, which managed the day care centre in the mall. When the first year of trading came to a close it was already becoming clear that the Belconnen Mall was a marketable product. In 1981 the Commonwealth Government made the decision to sell the mall on the grounds that government should not be in operating a shopping complex. Despite hiring a real estate consultant, this first attempt to sell was not successful . Many factors came into play while this sale was being negotiated, including community and business feedback and a federal election that resulted in a change of government. Eventually the CCDA was granted an extension to continue in its role. One of the more interesting publically disclosed offers was made by the small traders tenanted at the mall. Concerned that a change in ownership could lead to higher rents, and eager to avoid ownership by the government or big business, two proposals were put forward including a standard strata arrangement, and the formation of a public company. When none of the offers were accepted in 1983, the traders even took out an advertisement to catch the attention of the new Labor government. In 1984 Treasurer Paul Keating was at Australia’s fiscal helm and he was looking at reforms to reduce the budget deficit. 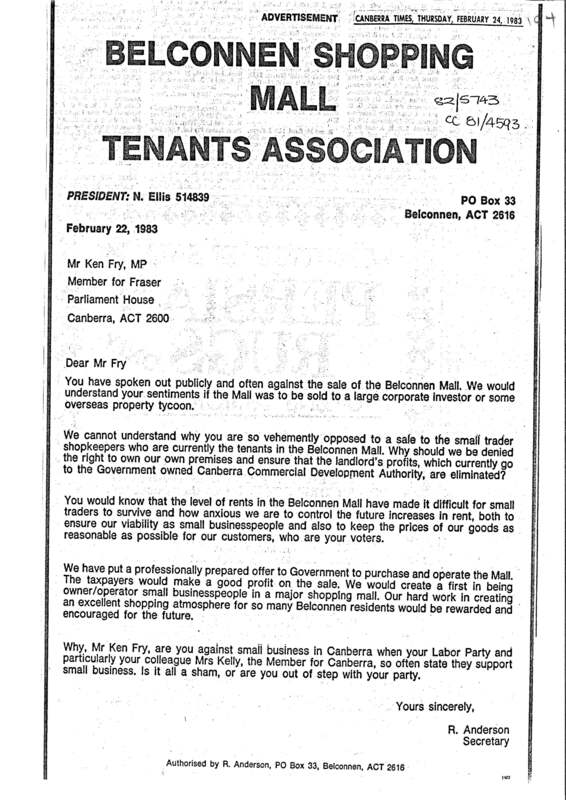 The ACT was not to escape his review of the financial arrangements between the states and territories, and in 1985 the decision was made to again offer the Belconnen Mall for sale. A request for registration of interest was released with interested parties expected to register by 25 July 1985 A deposit of $400,000 was required to reduce administrative costs by attracting only serious investors. This time around the debate was less visible than in 1982. 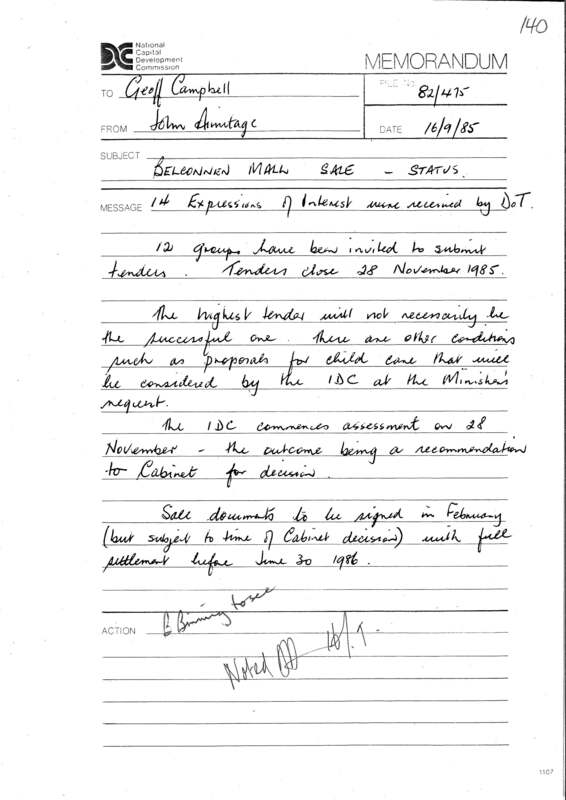 The government was determined to complete the transaction without delay and within the 1985/86 financial year. The main concern raised by members of the public involved the retention of the child care centre inside the mall. This issue was also noted by the Chief Planner who requested further consideration be given to retaining this community space . The Minister agreed to review the arrangement, and decided to protect the interests of the child care facility for a two year period until the new Belconnen Community Services premises were completed. In all, fourteen expressions of interest were received, and of these twelve groups were invited to submit tenders. NCDC officials noted that the highest tender might not necessarily win. In fact, the successful bid of $87 million was significantly less than the highest bid of $102 million and Prime Minister Hawke was called upon to explain the decision. The process was not without further issues, including a lengthy court case and investigations into an investor for attempting to bribe government officials. As with all tender processes, eventually there has to be a winner, and in this case the winning bid was a joint offer from the Commonwealth Superannuation Fund Investment Trust and Westfield Property Management Trust, with Westfield being responsible for the management of the asset. In this case, the condition of sale that tipped the scales in their favour was their ability to meet one of the government’s key goals – that the sale be finalised in full within the financial year. Contracts were exchanged on 17 December 1985 with settlement arranged for the following March 1986. And so, Westfield Shoppingtown came to be, and eventually Westfield Belconnen, but no matter who owns the building, Belconnen Mall – Belco to the natives - will continue to offer the community a safe place to meet and enjoy some retail therapy. Do you have any stories about the Belconnen Mall?